There are several versions of F.W. 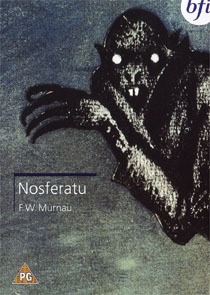 Murnau’s classic 1922 vampire film available on disc in the UK. The two most interesting ones are a two disc version released by Eureka Video, and a single-disc version from the British Film Institute (the BFI). 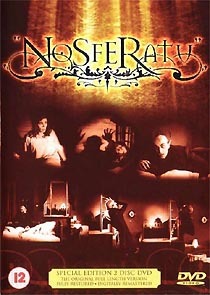 Eureka Video's version was released to coincide with the theatrical release of Shadow of the Vampire. The first disc contains the film, with uniform sepia-tone tinting, along with several additional features (detailed below). The second contains the film in unadulterated black-and-white, without most of the additional features, and without the very interesting – if soporific – commentary track. The black and white version would be the preferable presentation, if it didn’t seem to be much more prone to distracting digital compression artefacts. Both discs have elaborate, atmospheric, artificially aged animated menus. Eureka's packaging sells its contents short. There is a good selection of bonus material, including a fascinating thirteen-minute guide to the locations used in the film (amazingly many of the buildings and structures still survive, and look virtually the same as they did when it was shot), a short look at the film’s production design, the trailer for Shadow of the Vampire, (which pushes the film as an Ed Wood-style comedy), and text features on Nosferatu’s troubled history (legal action was taken by Bram Stoker’s widow for it’s similarity to Dracula, and all prints were supposed to have been destroyed) and vampire lore. The oddest addition to Eureka’s disc is a trailer extolling the viewer to “stock the genuine article” to cash in on the “resurging awareness” and “accelerated demand” being generated by the new John Malkovich movie! Since the sole surviving print was rediscovered (in London, or Germany, depending on which of Eureka’s versions you believe) many public domain presentations have branched off, some simply using its copyright-free status to generate revenue, others more interested in restoring the battered film to its original condition. Eureka’s presentation, which credits archives in Koblenz, Munich and Berlin, seems to fall closer to the former. Potential customers should be aware that this print, running 92 minutes, is more complete than one previously released on VHS by the same company (and other labels). It’s a reasonably commendable version, but it’s saddled with a grating industrial grunge 5.1 (at 448kbps) soundtrack (by Art Zoyd), and lacks the more elaborate tinting scheme favoured by more serious archivists. The BFI version contains what many scholars consider to be the definitive restoration, undertaken in 1997 by Channel 4, Münchner Filmmuseum and Cineteca del Comune di Bologna and Kevin Brownlow’s Photoplay Productions. This version presents the film with various tints (representing day, night, etc) intact, and with a score by Hammer Maestro James Bernard. The film aside, the disc is a little disappointing: there’s an excellent video essay by Professor Sir Christopher Frayling (24m) and a couple of insignificant text essays on the director and composer. The DVD-ROM essay about the restoration of the film is something that really should be have been presented as a featurette like the one on the BBC’s Doctor Who – The Tomb of the Cybermen disc, (especially as it’s not accessible to customers who don’t have a DVD-ROM drive!) It’s a shame too that Frayling hasn’t contributed a commentary track, since it is the often the most efficient way of conveying information (there are commentary tracks on a couple of the other discs, and it would be a shame if an uninformed customer were to choose another version over this BFI disc because of it).